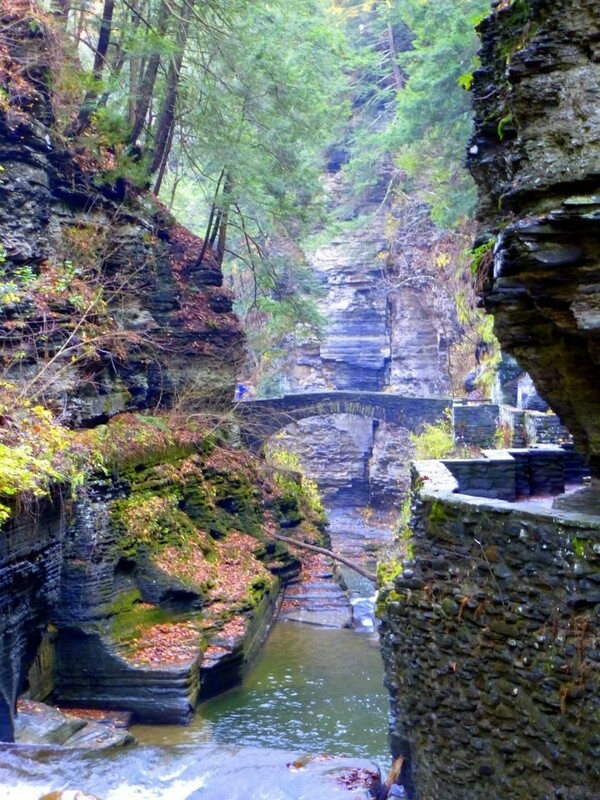 The waterfalls of Ithaca, NY are a natural treasure and geological wonder. There are hundreds of waterfalls, some spectacular, some humble. Gorges cutting through the shale, sandstone, and limestone are everywhere. Fifteen thousand years ago when glaciers retreated, erosion by many streams made these deep gorges, sometimes hundreds of feet deep, through the Pleistocene-era rock rich in Devonian fossils. 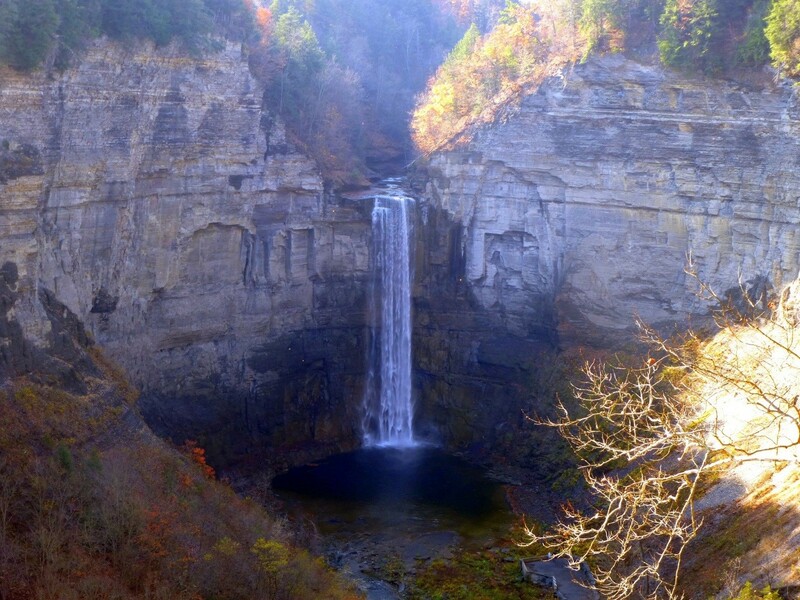 The tallest of the waterfalls in Ithaca, Taughannock Falls, at 215 feet is one of the tallest single-drop waterfalls east of the Rocky Mountains, exceeding the height of Niagara Falls by at least 25 feet (though much less in water volume than Niagara). The gorge walls rise 400 feet. It is an impressive sight at any time of year. Here it is pictured in late Fall. 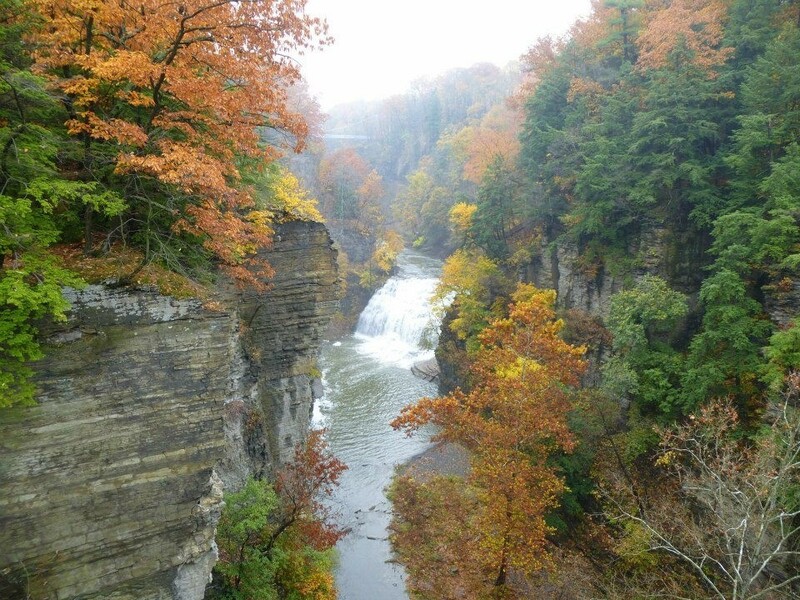 The name “Taughannock” is a Native American name of uncertain origins. Some say it comes from the Delaware indian word “takghanic” meaning “great fall in the woods.” Others say it is named after Chief Taughannock of the Delaware who was apparently thrown to his death in a battle there more than 200 years ago. Native Americans lived in this area rich in wildlife until their lands were given away to whites in return for service in the Revolutionary War. The Delawares, or Lenape people, were here, as were Cayugas, Tutelos, and Saponi people. They were run off their lands by the Sullivan Campaign of 1779, when US Army General John Sullivan ordered Iroquois confederation settlements burned and cleared – including all affiliated in any way with that confederation, known today as the Six Nations or Haudenosaunee (pronounced “Hoden-o-SHOW-nee”). Today, remnants of the Six Nations are scattered across upstate NY, including reservations for the Onondaga, Oneida, Seneca, Tuscarora, and Mohawk. The Cayuga are the only nation left without a reservation, although recently they were given 70 acres in the Aurora area. Somewhat ironically, the DAR (Daughters of the American Revolution) local chapter in Trumansburg, NY, near Taughannock Falls, call themselves the ‘Chief Taughannock’ Chapter. Symbolism aside, there remains a tenseness between many of the region’s white residents and the Native Americans. Non-indian residents formed a group called “Upstate Citizens for Equality” to combat the Cayuga land claims. The state also has tense relations with the tribes, cracking down violently on Mohawk “Ganienkeh” claim-related land occupations in the 1970s and 1980s, and denying the Cayuga Land Claim in 2005 after years of litigation by the tribe for ancestral lands. There is ongoing conflict over cigarette sales and taxes, bingo and gaming, and other matters of jurisdiction; as well as a simmering level of tension seen in graffiti and signs throughout the region. The beauty of Ithaca is imbued with rich natural, political, and cultural history that we must not forget. 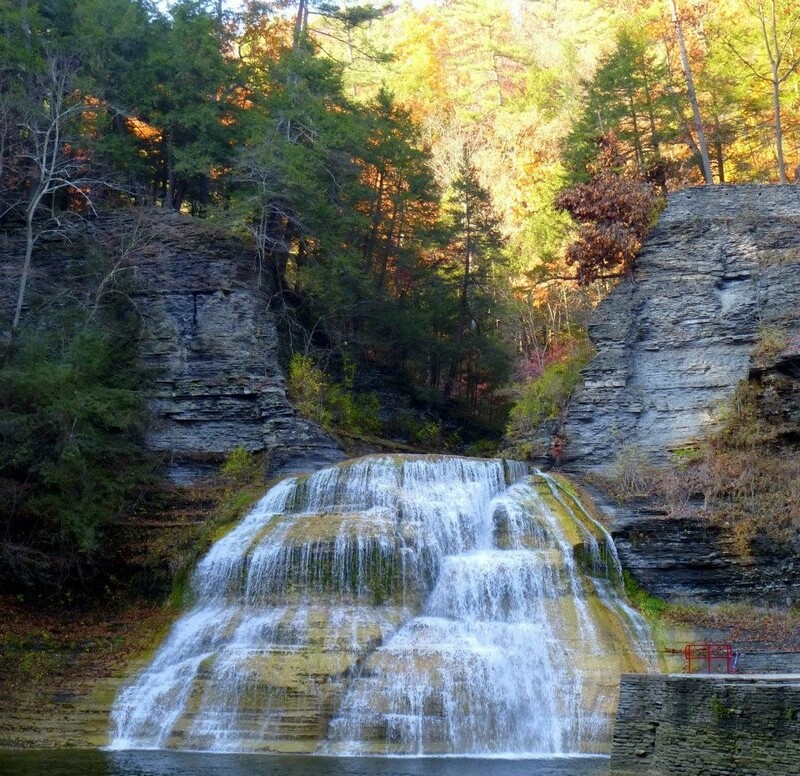 Lucifer Falls, with a drop of 115 feet, was purchased in 1916 by a Mr. Treman, who purchased more adjoining lands through 1920 and later donated all of it to be a park, which it is today. Many stone bridges dot this park, some dating from the 19th century and others built by Mr. Treman in the early 20th century (he hired an architect from Boston to build them). Treman also planted more than 10,000 trees. The Civilian Conservation Corps, created in the Great Depression, also built many of the trails, walls, and steps in the parks between 1933 and 1941. Wouldn’t it be wonderful if a similar corps could today help renew our national parks? Some of the founding principles of the U.S. Constitution came from the Haudenosaunee Six Nations. The U.S. Senate acknowledged in 1988 that “the confederation of the original thirteen colonies into one republic was influenced…by the Iroquois Confederacy, as many of the democratic principles which were incorporated into the Constitution itself.” One of the most important principles was The Great Law of Peace, or “Gayaneshagawa.” If we spent more on renewable energy and on conservation and less on giant military budgets, the beautiful lands of the U.S. would be in a lot better shape than they are today; between acid rain, flooding and erosion from global climate change, and shifting patterns leading to pest infestations and forest burning, the land cries as must the Haudenosaunee ancestors. 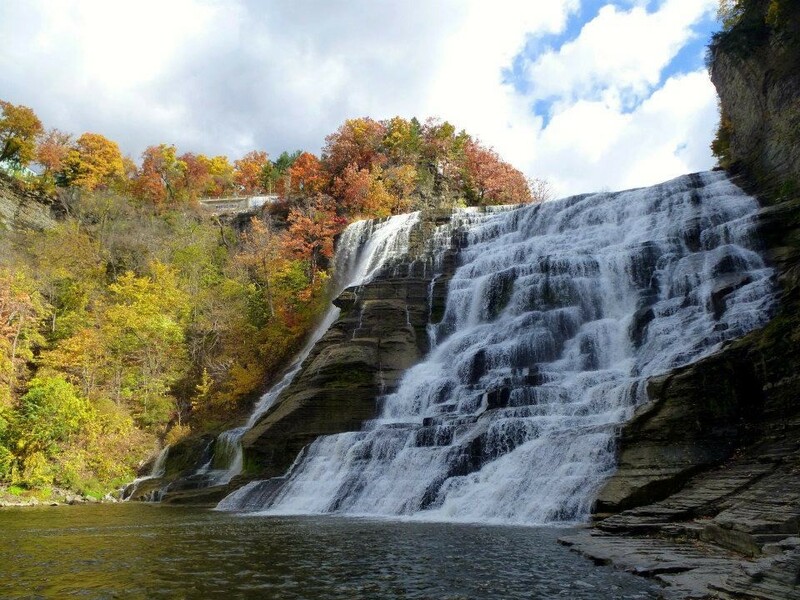 Ithaca Falls may be the highest-volume waterfall in the Ithaca area. 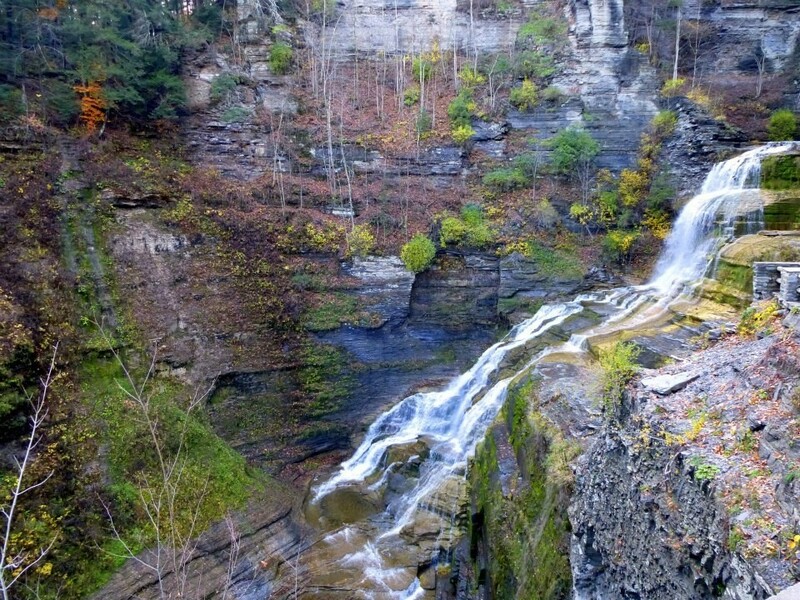 Estimated at 100 feet tall and 175 feet wide, these falls are within Ithaca city limits and visited by many on a daily basis. At the top of the falls sits the house where Carl Sagan lived for many years. He was a man with vision, not only for the stars but also for our own civilization and how we treat the earth. I wonder sometimes if the negatively charged ions created by the waterfalls, which purify the air and can stimulate the mind, inspired Carl in his thinking and writing. Many non-Indians who settle in the Ithaca area are farmers, including many organic farmers. Upstate NY has long been the home of various coalitions against pesticides and other toxic chemicals, and is a strong home of the anti-natural gas fracking industry as well as against the storage of low-level radioactive waste here. The natural beauty of the region draws and inspires people whose principles value our environment. The Onondaga Nation stands in firm opposition to natural gas fracking in the region; their drinking water would at a minimum be contaminated. They joined in a region-wide grassroots effort to stop the gas fracking industry from being allowed to operate, despite the potential short-term financial gain Native Americans could see from selling rights to the industry.